The Braves had some cash to burn this offseason (Craig Kimbrel is still available, folks), and some great young talent that could have been used as a trade chip for an established arm (Well, hello there, Corey Kluber!). But there was little chance that Atlanta was going to take those kinds of risks. And why should they? In a year where the division was essentially a birthright for Washington, and where the Philadelphia Phillies were in first place for a significant portion of it, the Braves rode the wave of great play from Ronald Acuna, a pitching staff that did just enough, and shortcomings from the aforementioned teams to win the division by 8 games. Because I believe in leaving no praise unsaid, this is where I tell you that the Braves ended the year with the largest division lead of any team in the Senior Circuit. Last year was also not supposed to really be “the” year. Atlanta knew that Acuna was not going to start the season on the big league roster. They knew that the starting rotation (beyond, uh, well…Mike Foltynewicz) would be punching above their weight. But, as we know, it all came together. As they say, heavy is the head that wears the crown: with winning comes expectations. The grand slam by Acuna in the NLDS was pretty great! Let’s see some more of that. Put Touki Touissant in the rotation now. Call up the Indians and just ask what it would take for Corey Kluber. Call Craig Kimbrel and make things right! As it turns out, it seems that the Braves front office is happy enough with what they have. The impact bat (I still have nightmares about John Hart, don’t you?) signing was Josh Donaldson, who was really great in 2015 and 2016. If healthy…well, you know the rest. Brian McCann will at the very least have a nice beard (and a veteran presence). Nick Markakis came back on a serious discount. Johan Camargo presumably won’t have to start, and can be an uber-utility player that not many other teams have (if any). Freddie Freeman is still here! And amongst the young trio of Swanson-Albies-Acuna, Dansby is the eldest…at 25 years old. That’s a whole lot of millenial going on! If there is a cause for concern, it would be the pitching staff for the Braves. The good news is that they have pitchers on the roster! Even young guys! However, the Braves essentially got a “best case scenario” version of Kevin Gausman, and the Julio Tehran who had that great performance at Coors a few years ago isn’t walking through that door. The bullpen will eventually have the late inning reliability of AJ Minter and Arodys Vizcaino, but they’ll have to get to the late innings first. There is likely a case to be made both for standing pat (as the Braves mostly did) and throwing a few more coins to nab some other players. It seems that the Atlanta front office liked the team just as they are. For the most part, the World Series isn’t won in the offseason anyway, right? What is the Braves’ most recent accomplishment? As mentioned above, the Braves were able to rally behind their young talent to win the NL East for the first time 2013. 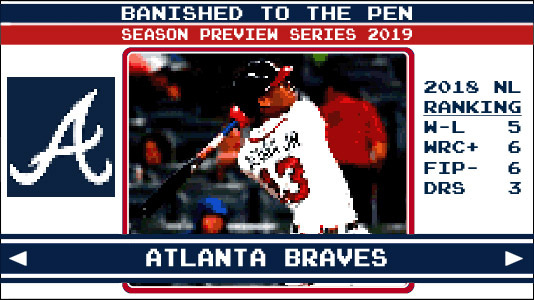 How will the Braves define success in 2019? In sports, most fans are only interested in linear movement. The Braves were in the NLDS last season, so anything short of that can’t be considered “successful”. A trip to the NLCS will be a lot to work with when the team is asking for season ticket commitments for 2020. I was really thinking that I would be able to assign this honor to a reliever, but Sean had other ideas! Sean had the highest WHIP (not good) and 81 walks in 164 innings pitched. Those numbers are better than 2017, so there’s some hope that with more experience, he’s able to attack the strike zone in a good way. On a pitching staff that isn’t exactly deep, that would be helpful! Here’s a fun fact about SunTrust Park: Because parking during the day is severely restricted (they rely on the businesses near the stadium in AtLOLanta), the Braves only have weekday games before 7 pm when they absolutely have to. That seems like a bad arrangement! Anyway, in an 81-game season, I was a little disappointed to see that less than half of the games will have some sort of unique giveaway. But, it looks like the Braves are making those giveaways count. My favorite is the Ozzie Gold Chain giveaway on Wednesday, June 19th. Baseball Players Wearing Gold Chains is a thing I can’t really get enough of, and I’m glad that the Braves are celebrating it.